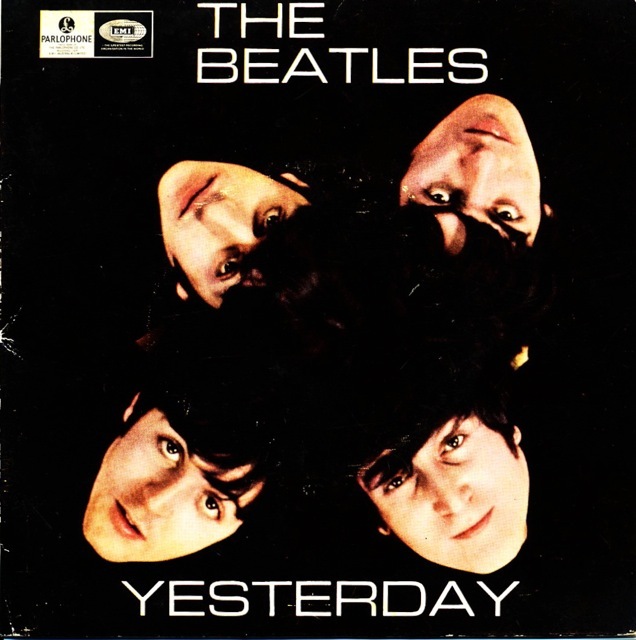 A trip to the south coast of New South Wales in Australia has turned up quite a nice copy of the Beatles EP “Yesterday”. It was discovered in an antiques, books and records store in a little country town called Kangaroo Valley, proof that its always worth checking out these sorts of shops when you find them. (This is the same place I found my copy of “The Beatles Forever” book). 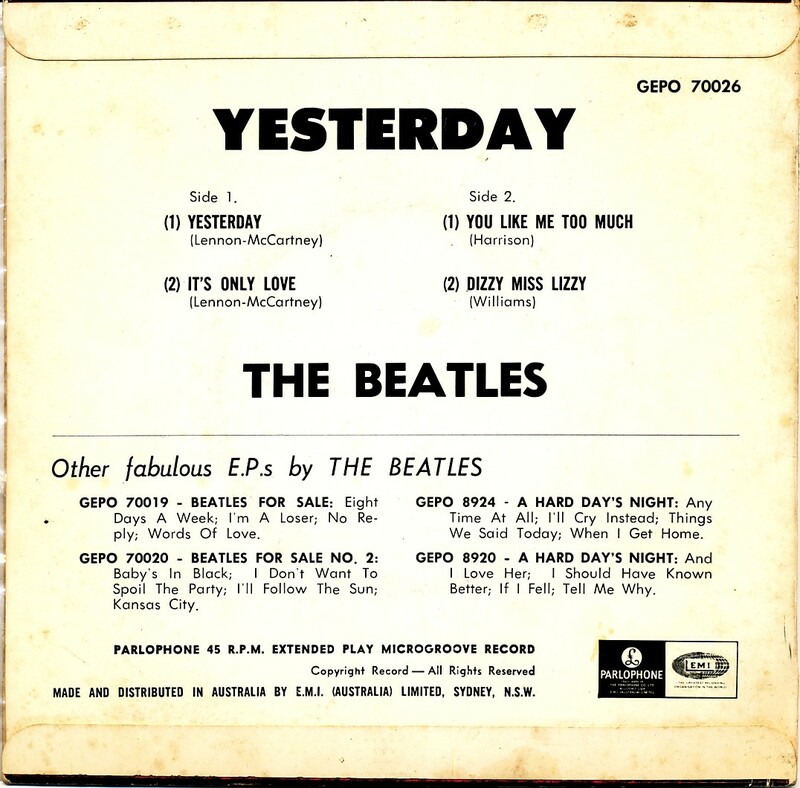 Good copies of the “Yesterday” EP are quite difficult to find in good condition as the cover is an image that is mostly black – except for the faces of the Fab Four. This means that it’s prone to the deadly “ring wear”, where the 45 rpm disc inside rubs against the outside when it is stacked or stored with other records creating a white “ring” in the centre of the image. As you can see above this particular copy is in pretty good condition with very little, if any, ring wear on the front cover. 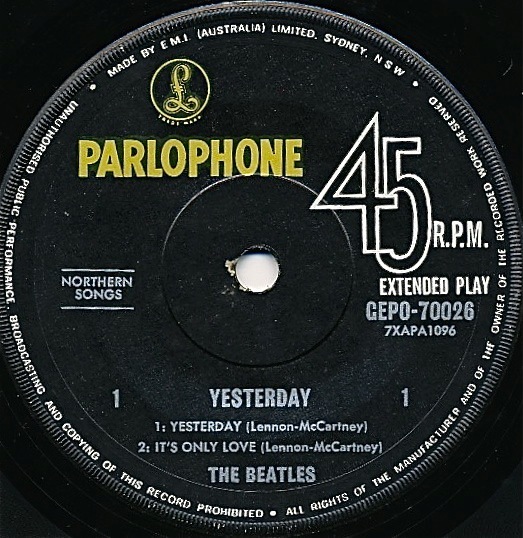 This is the Australian release – and dates from between 1966-1968, although these EP’s where released right up to 1979 (thanks to Jaesen Jones and his very informative book “An Overview of Australian Beatles Records” – which has only just been released this year). The other indicator of this little record’s age is the style of the Parlophone/EMI logo (seen above on the rear sleeve) and of the record label (below), which indicates again it was released sometime between 1966 and 1968. The serial number for this disc is GEPO 70026. All-in-all a nice copy of a quite old, four song Beatles Extended Play. For more on Beatles EP’s see this Japanese box set. This entry was posted in Beatles, Beatles Collecting, Beatles Music, EMI Records, Parlophone Records and tagged Beatles, Beatles Collecting, Beatles EP, Music, Parlophone Records by beatlesblogger. Bookmark the permalink.